Have you ever wanted to look inside a beehive, watch beekeepers open hives, or even don a protective bee suit to help them do this? Are you interested in learning more about bees and beekeeping? Perhaps you already keep bees or are considering becoming a beekeeper. Do you wish to learn more about the importance of honey bees for our food security? Then our apiary may be just the place for you to visit. It is open on the second and fourth Sunday of each month from 10:30 to 3:30, except during winter when it is only open on the fourth Sunday. (In 2018 it will be open on 16th December in lieu of 23rd December). To reach the apiary, go to the end of St Heliers St, Abbotsford and go through the main entrance to the Farm precinct. At the Capital City path turn right and walk approx. 300 metres along it. The apiary can also be reached along the Capital City path from a westerly direction. 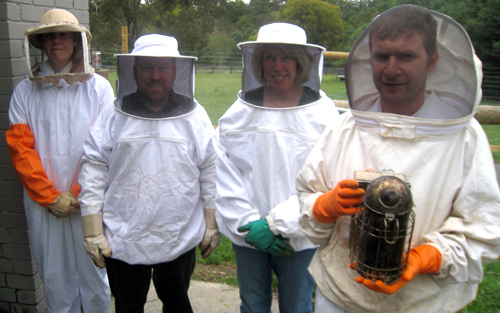 The apiary is jointly managed by the Collingwood Children’s Farm and the Victorian Apiarists’ Association Melbourne Section.